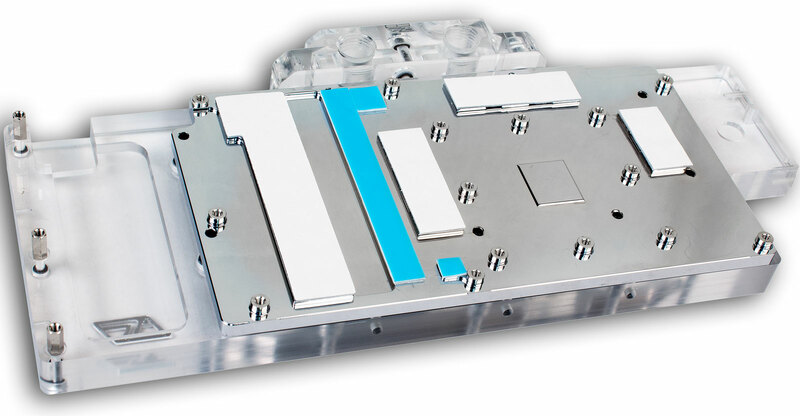 The Komodo™ NV-ECO GTX 1080 full cover VGA waterblock is a high performance cooling solution with advanced thermal design and low flow restriction, compatible with Nvidia's GeForce GTX 1080 and GTX 1070 flagship graphics cards reference PCB designs (see brand models in the compatibility section). 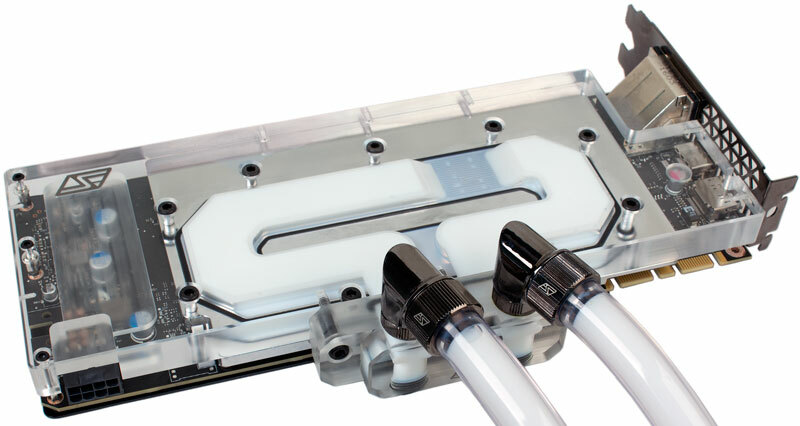 The waterblock shares the same cooling engine as the LE (Luxury Edition) version of the series, but uses an all-acrylic housing instead, making it more economical. Thermal and hydraulic performance are identical to the LE version. Proper cooling of all the critical components contributes to overclocking stability, reliable operations, and longevity of the graphics card. The block covers the entire PCB, leaving no components exposed to possible damages during handling. 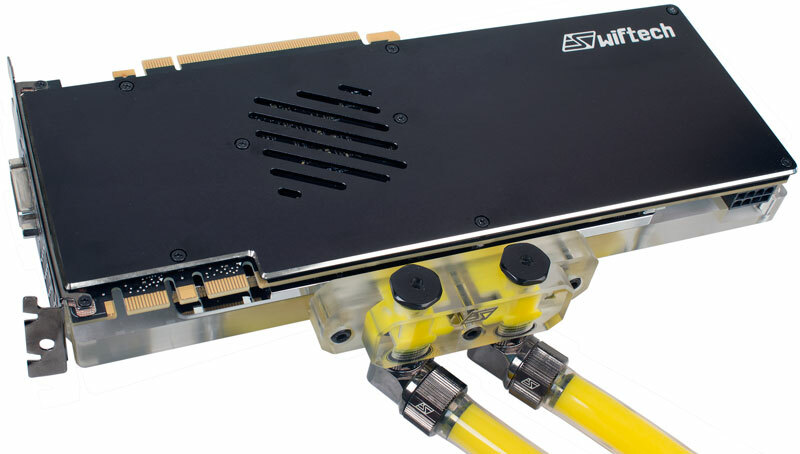 SLI installations: Fully compatible with Swiftech's new Universal bridges. See the bridges product page. Why is the Komodo-NV a superior cooling solution ? The only true full cover water-block The blocks cover the full length of the card and utilizes all the original circuit board mounting points; this results in superior thermal interface with all the components, but more importantly it prevents bending and/or damage to the card compared to competing solutions that leave critical components exposed for cost saving purposes; the Komodo NV series continue this exclusive Swiftech® initiative as a true professional solution (an industry first). 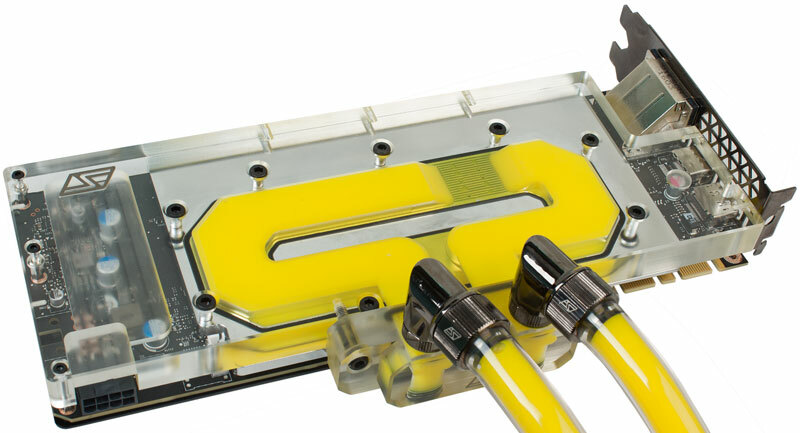 Moderate flow restriction by design The water channels have been optimized for optimum flow rate in order to take into account multiple waterblocks in the same loop; additionally, the high efficiency of the thermal design authorizes better thermal performance at low flow rates. True Chrome Plated copper base plate Maintenance-free, corrosion-free, discoloration-free, and a brighter whiter color: the precision CNC machined copper base plate is plated with true chrome, as opposed to commonly used nickel plating (which is yellowish). Precision CNC machined housing The main housing is precision CNC machined out of acrylic material. Pre-applied thermal pads High conductivity thermal pads and reusable high performance gap-fillers are pre-applied to the memory, VR and other components; there is no need to waste time cutting thermal pads as is often the case with other blocks; high quality Tim-Mate™ 2 thermal grease is included with the water-block for application to the GPU area. Depending on your motherboard, up to four Komodo NV-ECO GTX1080 waterblocks can be interconnected using Lok-Seal™ adjustable connector fittings, or the upcoming Swiftech SLI bridges (to be announced). The KOMODO-NV-ECO GTX1080 is compatible with Nvidia® reference PCB designs PG413 (Geforce GTX1080) and PG411 (Geforce GTX1070). The PCB revision number represents the deciding factor to go by when selecting your Swiftech product, rather than the brand and/or model number of the card. 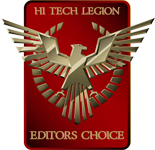 "the Komodo NV-LE exceeded all expectations in terms of performance. The gap between the Komodo NV-LE and the other blocks tested was large enough that I actually went back and remounted the other blocks to verify my findings"